Beth Mathis and her balance &amp; brace dog, Jack Daniels. Editor's Note: 'Empowering Lives: Stories from Our Colorado' are stories about the challenges the staff at Colorado's renowned Craig Hospital help people overcome every day thanks to the generosity of people like you. The six-week series will culminate in a 'Day of Donation' on Monday, April 8. To learn more about how you can help, visit the ' Empowering Lives: Day of Donation ' page to learn more. ENGLEWOOD, Colo. – It was five years ago when Beth Mathis woke up unable to breathe. She had had a lung hemorrhage and two strokes. “I had two neurologists tell me that the likelihood of me ever walking again was very little,” she said. An active mom, horse woman and businessowner, Beth spent three months in the hospital unsure of what her future held. “I was having a hard time finding my new identity and feeling like I was human again because so much had changed for me,” she recalled. One day, when she says she was at her lowest, her therapist told her to pet a dog that was visiting the therapy room. Suddenly, everything changed. Beth found a way to let that person out with the help of her “Colorado Mountain Dog” – Jack Daniels. 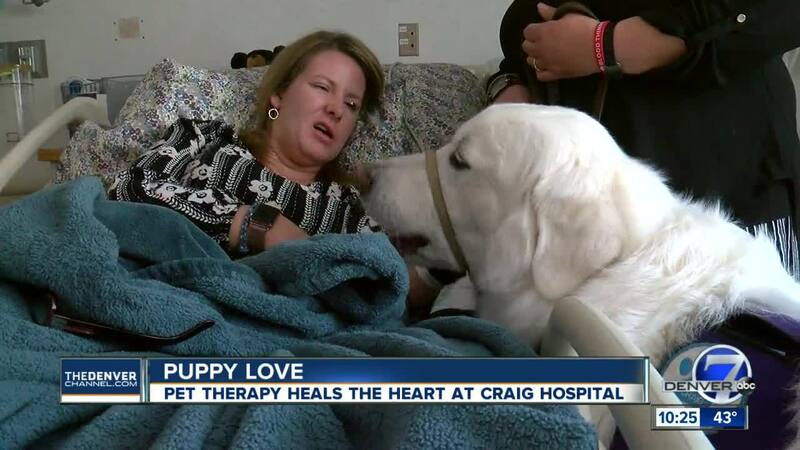 Jack is trained to be her “Balance and Brace” dog when she is standing and walking, but a couple of times every week, the two of them navigate the halls of Craig Hospital together, visiting with staff and patients. One of their favorite stops is with Sonja, a stroke patient who has challenges very similar to the ones Beth had to overcome. Therapeutic recreation specialist Lori Womeldorff says it’s the unconditional love that animals provide that helps them bond with so many patients. “They don’t care if you can’t maybe pet them because your hands are weak or if you can’t speak to them because you don’t have your voice at the time,” she said. But for many patients, like Richard who lived in California before coming to Craig, the biggest connection to animals like Jack are that they are simply a reminder of home. “I miss my dogs so much and I saw him and it just really gives me a good feeling,” Richard said. With the help of Jack, Beth has found her new purpose in life, helping others whose lives have changed find a path to healing and their own new roads ahead. “To be able to show people what life looks like a little bit later is really important to me,” Beth said. Many of the programs at Craig Hospital are not covered by insurance. It’s generous people and organizations who make the programs possible. Denver7 & the Craig Foundation are teaming up for ' Empowering Lives: Day of Donation' on Monday, April 8. Click here to learn more about the programs offered at Craig and how you can donate right now.